Deepak Chopra ( born October 22, 1946) is an American author, public speaker, alternative medicine advocate, and a prominent figure in the New Age movement. Through his books and videos, he has become one of the best-known and wealthiest figures in alternative medicine. 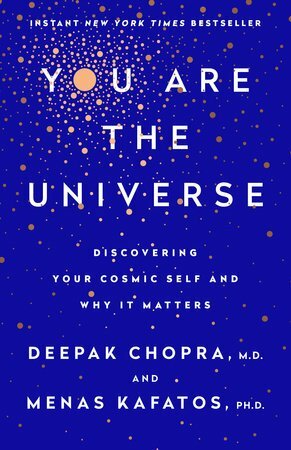 With more than 85 books, including twenty-five New York Times Bestsellers, You Are The Universe: Discovering Your Cosmic Self and Why it Matters, became an instant New York Times Best Seller and Wall Street Journal Bestseller. Born Deepak Chopra in 1947 (he claims to have forgotten his exact birthday) in New Delhi, India. The son of an eminent cardiologist, Krishnan Chopra, Deepak at first spurned his father’s career path, wanting instead to pursue a career as a journalist. Eventually, however, he became enthralled with the subject of medicine and enrolled at the All India Institute of Medical Sciences in his native city.Chopra envisioned a career in Western medicine, and in 1970 moved to the United States, leaving his home country with just $25 in his pocket and the promise of a residency at a hospital in New Jersey. Following the residency, Chopra landed in Boston, where he quickly rose to chief of medicine at New England Memorial Hospital.Despite his rising career, Chopra became disenchanted with Western medicine and its reliance on prescription drugs. The work began to wear on the promising doctor, who would later claim that he smoked up to a pack of cigarettes a day and drank consistently. “Very unhappy people, physicians,” he has said. “The relatives of patients with whom they deal are demanding, litigious, intimidating. That’s the environment of medicine. Most of my fellow colleagues were very stressed; a lot of them were addicts. I used to experience the most extraordinary frustration and tightness. My great fear was getting into trouble. Malpractice suits are a big deal in the United States.”It’s during this time that Chopra read a book on transcendental medicine that changed his life, and eventually his career path. As his interest in alternative medicine deepened, so did his view on the limits of Western medicine.After a meeting with transcendental mediation guru Maharishi Mahesh Yogi, Chopra quit his job at New England Memorial Hospital and started the Maharishi Ayur-Veda Products International, a company that specialized in alternative products, like herbal teas and oils. Co-founded with the Maharishi, the company successfully launched Chopra into the world of alternative medicine. Chopra helped oversee the creation of several affiliated clinics and, among the rich and famous like Elizabeth Taylor, Michael Jackson, and fashion designer Donna Karan, Chopra became a household name. By the early 1990s, Chopra had split off from the Maharishi and relocated to California, where he became the executive director of the Sharp Institute for Human Potential and Mind/Body Medicine. But he eventually clashed with his bosses and, in 1995, he started the Chopra Center for Well Being in La Jolla.By this time, Chopra had become an international success. His first book, Quantum Healing: Exploring the Frontiers of Mind/Body Medicine, published in 1989, proved to be a decent seller. But it was his 1993 release Ageless Body, Timeless Mind, which shot Chopra into full-fledged celebrity status, selling more than a million hardcover copies alone.At a time when the self-help industry was coming into its own, Chopra was showing the world how to be one of its leading faces. Chopra’s core message centers around the idea that the decadence of Western life leads to a complicated reliance on a material world to find happiness. In June 1999, Time magazine dubbed Chopra “the poet-prophet of alternative medicine” and called him one of the top 100 heroes of the century. His celebrity status hasn’t diminished his own standing within the celebrity world. To Chopra, the answers to our health and happiness can be found internally. His message has certainly resonated with the greater public. In total, Chopra has published more than 50 books, which includes 14 bestsellers, many of which have been translated into a number of different languages. Chopra is also a regular columnist for the San Francisco Chronicle and the Washington Post. In 1989, Deepak Chopra was honored with the title of ‘Dhanvantari’ (God of Immortality) by the Maharishi Mahesh Yogi. In 1995, he was the receiver of Toastmasters’ ‘International Top Five Outstanding Speakers’ award and in 1997, he received the Golden Gavel Award from Toastmasters. He was given the Medal of the Presidency of the Italian Republic by the Pio Manzu International Scientific Committee and was represented as ‘one of the most lucid and inspired philosophers of that time’ by the Chairman and former Soviet Premier Mikhail Gorbachev. He was nominated as one of the ‘top ten motivational speakers in the country’ by Esquire magazine. In the year 2006, the National Ethnic Coalition of Organizations honored Mr. Chopra with Ellis Island Medal of Honor and in 2009, he was given the Oceana Award. It was in 2010, when he was honored with the Cinequest Life of a Maverick award for his alliances with filmmaker, Shekhar Kapoor. He was given the Humanitarian Starlite Award (2010) for the ‘global force of human empowerment, well-being and for bringing light to the world’. In the same year he was honored with GOI Peace Award. His book, ‘Peace Is the Way’ received the Quill Awards and ‘The Book of Secrets: Unlocking the Hidden Dimensions of Your Life’ got the Nautilus Award. Deepak Chopra played a very important role in taking the Ayurveda treatment and medicines to an international level. He is the one who provided Ayurveda medicines and treatments for healing and for the peace of mind and body. He earned name and fame with the publication of his bestselling spiritual books Ageless Body, Timeless Mind (1993) and The Seven Spiritual Laws of Success (1995).Some of his other books are Grow Younger, Live Longer (2001), Life After Death: The Burden of Proof (2006), and Buddha: A Story of Enlightenment (2007). Deepak Chopra has been a part of the Cancer documentary drama of UniGlobe Entertainment which is about the spirit, mind, body and the secret of life and death. This documentary is made under the direction of the actress Namrata Singh Gujral.